Click the image for a larger graphic with readable text. This weekend someone asked me how many pork chops and other cuts of meat in a half pig. As luck would have it we just sent four half pigs to the butcher. Below is a typical breakdown using the numbers from one of those halves. This is probably more info than ever you wanted to know about half a pig. If not, ask questions! About 23 pork chops from a half pig, 2 roasts, 1 fresh ham, 8 lbs of fresh bacon slab, 3 lbs of spare ribs, 9 lbs of ground pork, etc totaling about 75 lbs in the freezer for this half pig. That was a little on the high side. Most pigs are between 60 and 70 lbs for a half share. The chart above gives you a quick graphic view. Click on the image for a larger graphic so you can read the small print. This can vary with the individual pig as well as how thick pork chops are cut and such. First note that a pig can be raised to the size you need. Some people prefer smaller pigs, others larger. As they get larger there is more fat to lean. A typical slaughter weight is between 250 lbs yielding about 180 lbs hanging weight. If you just take the prime commercial cuts that is about 120 lbs in the freezer. If you take the whole pig, nose to tail, that will give you about 160 lbs which includes great stuff like the hocks, soup bones, lard, liver, jowls (like bacon), head, trotters and other things. The pig is good to eat, end-to-end. If you prefer you can specify custom cutting and they’ll follow your instructions. For example, perhaps you want more ground meat, no hams and no roasts. Or maybe you would like tenderloin and fewer pork chops. Or perhaps you want to reduce the bacon and go with more ribs. If you aren’t sure, just say “Standard cut for a family size of 2” or what ever size your family is. You’ll get great meat in familiar cuts like those from the market. The other big question the butcher may ask is what type of sausage you want. Realize that this is sausage patties in one pound packages. It is not sausage in the little wiener links. We use this at our house for meat balls, chili, American chop suey, spaghetti sauce, breakfast sausage patties with fresh pastured chicken eggs, etc. The option at most butchers is: Plain (no spices), sweet Italian, Mild Italian, Hot Italian or Maple Breakfast. For a standard cut there is only about nine pounds of sausage so just pick one type of seasoning. The photo above shows this half pig share laid out on the table all wrapped up in cuts. 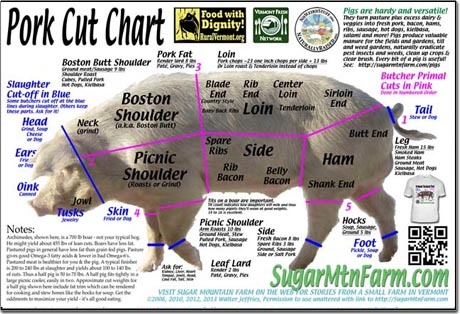 Below is a chart of the actual cuts from this half pig. The reason for the pork chops being 7 packs of 2 and 3 packs of 3 is that is convient for for a family of two. If you are a family of four ask for four chops to a package, etc. The smaller pork chops near the end were packed three to a package to adjust for their smaller size, thus the two different package sizes. Total count of pork chops was 23 for the half pig. These were thick 1″ pork chops. Thinner 3/4″ pork chops would yield more chops from the same pig. A shorter pig would yield fewer, a longer pig more. There is some natural variation. Figure on the typical pig having around 20 pork chops per side – more is a bonus. Also note there may be an oddly sliced pork chop towards the end – small and great for a child or sandwich. Above is that same pig packed in one picnic cooler plus the ham and bacon soon to be brining in a five gallon pail. 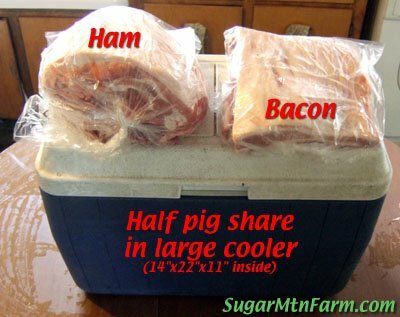 If I took the ice out of the cooler the ham and bacon barely fit. A typical pig would have yielded 60 to 70 lbs of cuts. This pig was a little bigger. 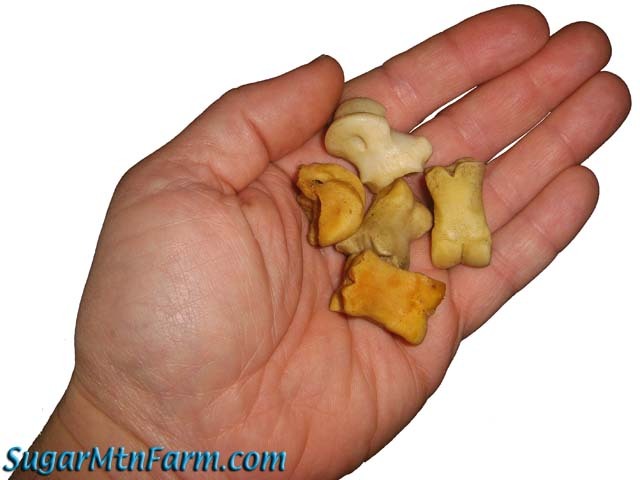 Since these are pasture raised, heritage breed animals, they are real live creatures – thus they have some variance rather than the cookie cutter uniformity of factory farmed products. The “hanging weight” was 78 lbs for this half pig share. One interesting thing is the left side and the right side weight slightly different amounts. On this pig the other side was 80 lbs. Thus the whole pig’s “hanging weight” was 78 + 80 = 158 lbs. This was measured without the skin, head or feet. Note that some places measure the hanging weight with skin, head and feet on and would thus have a significantly higher hanging weight. Had the pig been scalded and scraped instead of skinned the hanging weight would have been higher, more like 215 lbs or about 107 lbs per half. The trade off is that with the lower hanging weight some meat in the feet, head, tail, neck, jowl and the skin (pork rinds) was lost. This is important to know if you are buying by the pound hanging weight. Note that the processing is a big part of the cost in a pig. If you process your pig yourself, be it just the butchering or also the slaughtering, then you save a lot of money. It’s a skill you can learn. You can do an entire pig with just knives, no saws required so you don’t have to have fancy equipment. Of course, to make bone in commercial chops you’ll need a bandsaw and you’ll probably want a grinder too. lbs for the half instead of 75 lbs. 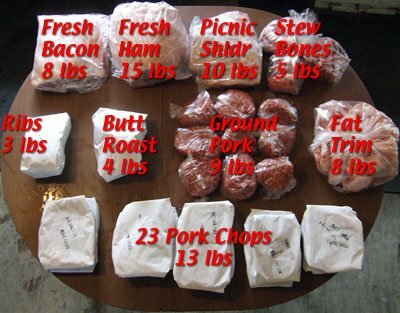 That difference of 12 lbs is almost all waste that goes in the trash but you would pay for it anyways in a higher butcher bill. If you are buying by the pound then with the head, skin and feet on your would also pay a higher price for the hanging pig. Ask about this little detail if you buy by the pound “hanging weight”. The “live weight” was approximately 300 for this pig. We don’t have a big enough scale for live pigs so we measure by taping them. This is a pretty good estimate. See this article about how to weight a pig with a string. Note that these are from early in 2006 prices in the examples. The prices of slaughter, butchering, smoking, fuel and the pig itself have all changed a lot over the years with the large increases in the cost of nearly everything. Early 2009 and 2015† prices have been added to the tables below for comparison and the 2006 prices have been kept for historical information. For up-to-date pricing see our web site. Linked sausage is also now available at $2.50/lb. See the article Sausage and Law. *Buying a half pig is the expensive way to do it. The half pig price is $5.00/lb whereas the whole pig price is a much lower $4.25/lb. This savings reflects that when you buy in volume you save me the time and effort of matching your order up with someone else and handling two separate order. A big savings I can pass on to you. **A pig can be raised to any size, within reason, so if you want a larger pig, just ask. Hanging weight at the butcher we work with most is defined by her as after the butcher slaughters & guts, typically about 72% of live weight scalded and scraped, head on, feet on. The butcher defines it differently than the previous butcher who slaughtered and then skinned removing the head & feet yielding less meat. The advantage of the current butcher is there is more meat available in the final order including bones for soup, head, feet, tail and other things that the previous butcher tossed out. This accounts for the difference in hanging weight for the same pig so I have averaged them both to 180 lbs which is fairly typical. ††All the pig is good to eat. There is a lot more beyond the commercial cuts you see in the stores. Trotters for thickening soups and stews, hocks slow cooked, organ meats, tail, head cheese a.k.a. brawn and more. And what did the farmer (me) get per pound? We keep about 60¢/lb in 2009 dollars. That’s a little more than we were getting in 2006 which helps with the increased costs of living. We won’t get rich raising pigs but the life is good, the pigs are happy and fortunately I never have to worry about where our next meal is coming from! There are smoke houses that will take the fresh hams and bacon and maple cure them or smoke them to your preference. 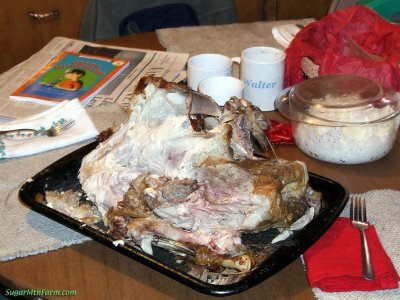 When we slaughter for our family we don’t smoke the meat, we just brine it which is delicious. See this article about brining a ham to see how we do it. 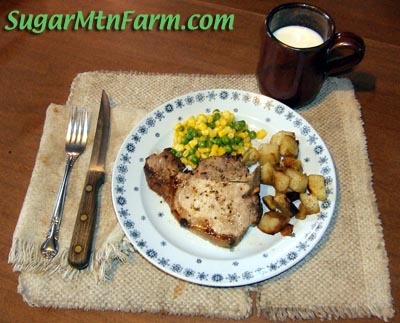 Below is the finished product – a fresh, pasture raised pork chop. Ten months from breeding to butcher, raised on pasture, hay, milk and cheese. Delicious to the last bite! You may find the article “What Good is a Pig: Cuts of Pork Nose to Tail” helpful. Update 2008-07-01: Note that since this article was published there are a few changes. Our butcher now uses vacuum packaging which gives a longer storage life in the freezer. This costs a little more per pound but is worth it. We now sell by hanging weight rather than halves and wholes. See our web site for up to date prices and if you have any questions, just email me. Great article. I wish I had seen this when I ordered my last pig two years ago. Do you ship meat? We do ship meat. If you can I would advise you to get it from a local source since the shipping is fairly expensive. It must go express and there is the added weight and cost of the packaging and ice. But if you can’t find a local source for pastured meat then visit our Literature page where you’ll find the order form. In the bottom half of the page is information about boxed packages of meat which are shippable and we can even ship whole pigs – details at the bottom of the order form. Additionally check out the CSA page. From now until we finish the butcher shop we are offering free processing to people who pre-buy whole pigs and decades of pork. Those are fantastic deals that save about 30%. Walt when will you open the butcher shop? I would love to get your meat and would want it done completely on your farm from birth to smoking. Will you be doing the fancier sausages? How much money have you spent on your project so far and how much more do you need to finish? I might be able to help with a small loan. Probably not everything you need for such a big project but it might help. We are a little behind schedule but right on schedule according to what I’ve read about how long it takes to build a facility. So I feel okay. I had hoped to be cutting this late summer but things come up and take longer than expected. We’re almost ready to make the last exterior pour that will close in the building so we can work on the interior. In a few months I expect to be done with that and able to start cutting meat in the butcher shop. Perhaps February or March at the latest? We’re really looking forward to it. We do plan to do many types of sausages. Currently we offer Hot Italian, Sweet Italian, Breakfast Sage, Kielbasa and our smoked Hot Dogs. The first additional sausage I want to offer is a real Maple Breakfast sausage made with our local Vermont maple sugar. I love those. We also plan to eventually have the cold kitchen for making fermented sausages, salami, pepperoni as well as eventually doing prosciutto and the like. I’m very open to suggestions on sausage types. What are your favorites? As to “Finished” that is a slippery term. We are doing the facility in phases. The first phase is simply getting the shell of the building done such that we can then finish off the interior enough to do meat cutting and sausage. During this phase we’ll continue taking our pigs to the USDA inspected slaugherhouse down in Mass for slaughter. Butchering, the meat cutting and sausage, is the most expensive part of processing and must be in place before we can start doing slaughter. Once we have the butchering running smoothly we’ll finish off the chiller, abattoir (kill floor) and lairage where the pigs rest the night before slaughter. Once that is running smoothly then we’ll probably do the cold kitchen, warm kitchen and add smoking using a small smoker to get the hanging of things. Later we’ll add a much larger double smokehouse in the the space already built for it. This will let us smoke whole pigs. Later again we’ll setup for doing pork rinds (chicharones) and lard which is excellent in cooking. Doing all of that will take several years. 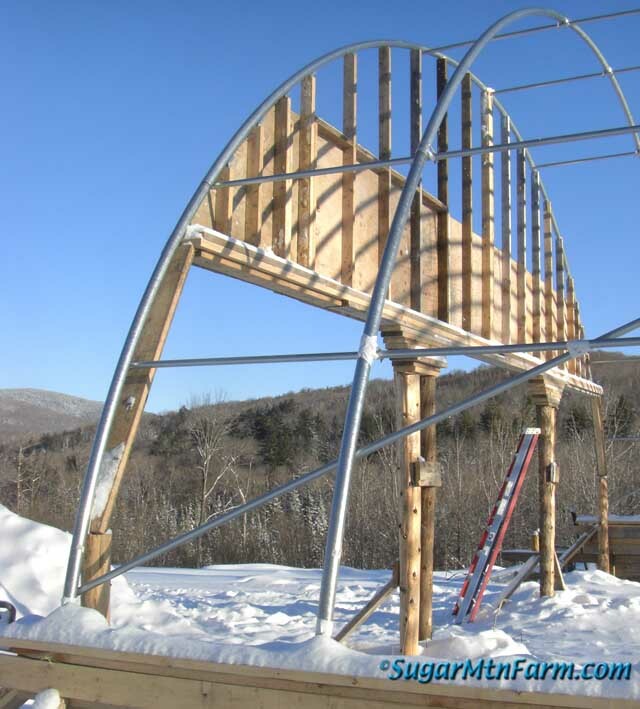 We also plan to setup a coolth attic that will store winter through our summers using 192,000 lbs of thermal mass for a heat sink in order to cut our energy consumption to a bare minimum. As old Ben would have said in modern times, “A penny saved is 1.36¢ earned.” I also want to add solar hot water heating down the road. I have built the facility with that in mind. We’re a little beyond our anticipated budget of $150K to the point of butchering but I had made that original budget up over four years ago and there have been some significant increases in materials costs since then plus I’ve expanded a few things which will make things better than originally planned and we also have already bought the scalder/dehairer which we’ll need for the next phase. To get to the point of doing the butchering on farm I anticipate that it will cost another $50K to $60K. We have some money now to keep going. If you’re interested in doing a loan then contact me by email and we can talk about interest and terms. We kept pigs for the first time this year and it was a delight. We fallowed your methods to the t and the meat has been delicious! We’ll do it again next year. We raised three. Two for our family plus one for my sister’s family. Next year one of my office mates wants us to raise one for their family. Any suggestions on pricing? The hardest thing about raising them was finding a butcher to do the deed. This year we were able to find a guy who came out to our farm and that was ideal but I know that if I sell the meat then I need to get it done in an inspected place to make it all legal and up and up. Obviously I’m not going to build a butcher shop like yours for just a few pigs once a year but I wish there were more around here. Before we found the guy who came out we tried to get in to one of the local usda inspected butchers but they were all ready booked up through January when we talked to them in July. Next year I will schedule earlier. Good luck on your project. I will spread the word about you looking for a little more money to help finish. Maybe I can find you some people interested in CSAs and loans. You are wise to go the legal route on the slaughter and butchering. I’ve seen some people who tried to fly under the radar but got caught by the government and had to pay hefty fines. Don’t go there. Additionally a good butcher will have a vacuum packaging machine which means the meat lasts longer and is higher quality both fresh and frozen. We charge $3.50/lb hanging weight for a whole pig plus the slaughter ($45), meat cutting ($135) and any smoking ($2.50/lb) and sausage ($2.50/lb) that the customer would like. Check out our order form for details. Also look around locally and see what other farmers are charging in your area. Be sure to compare apples to apples. Don’t compare with the manager’s special at the supermarket as that is often a loss leader and meat that is about to go out of date, has been frozen and thawed and refrozen, etc. Pricing is one of the hardest things in raising food. Or perhaps any market. You want to produce a quality product and then charge a reasonable price that fits your local market and covers all of your costs. Under pricing does a disservice to yourself (because you won’t be able to do it sustainably for long), your customer (because they develop unrealistic expectations) and to other farmers (because you floor the market). I wish I had much to loan you for your project because I get no interest at the bank. Unfortunately I have to pay my bills every month on unemployment and savings right now as I lost my job. If I still had my job I would be on top of this in a moment! How much are you paying for interest on loans? Just curious. Just incase things change here. Sorry to hear about you losing your job. That must be stressful. Keep your head up and putting one foot in front of the other. The rate we’re paying on loans is better than banks, but then banks will tell you the risk is higher too so that makes sense. If you want email me for exact numbers as that is a better place to discuss this. Wow, fabulous chart! I love it. I just purchased a pig from a local farmer and was trying to figure out what the cuts were for filling out the cut sheet he gave me. Love your web site and how you do everything. I and my family are interested in buying half pig. I see the whole pig prices are better. Can we split two half pigs that is to say a whole pig with another family and get the lower whole pig pricing? Can we send you a paypal or credit card? Yes, you can combine two order into a whole pig order. You’ll be responsible for divying up the meet between your family and your friends. Get their order desires and organize that into a single order. Because we do many pigs every week you can get a few of each tie of sausage that you want rather than having to buy a whole 25 lb batch. Sausage can be linked, patties or bagged. Smoking takes six to eight weeks extra but some times we have some already in process that can make that go faster. Yes, we can take PayPal payments for your $100 deposit. When you’re ready just send a $100 payment to my email address of walterj@sugarmtnfarm.com with a note of what you would like. I’ll then do the cut sheet with you and schedule with the butcher. Generally it takes two to three weeks to get into the butcher’s schedule and then get the meat back. 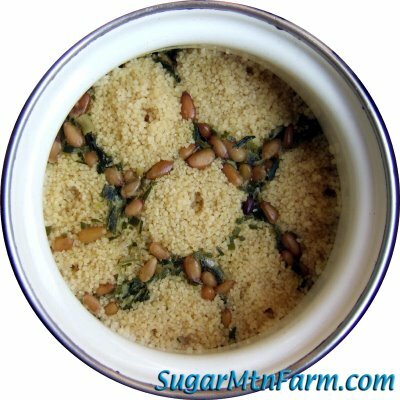 See the lower section of the order form at http://SugarMtnFarm.com/lit for details. Let me know if you have any questions. Is the 60¢/lb in 2009 dollars you keep live weight or hanging weight? Has it changed in recent years? Can you compare your costs per pig vs. the 2012 costs listed on the keeping-a-pig-for-meat post? That’s based on hanging weight. Our portion has gone down slightly because the cost of gasoline, diesel and processing have all gone up since 2009. The comparison over the years sounds like a good topic for an article. I’ll add it to my list. We also raise pastured pigs, just started about 1 year and a half ago and are working on our breeding stock. I am asking for advice from someone with more experience with the process. To work through our genetics and get a better feel we, at least for the short term, are using a boar for about a 1.5 to 2 yrs. We have been using a really good slaughterhouse near us and been averaging live to hung of 70+/1% and hung to packaged of 72+/1% with our market size pigs. The people we use skin, which fine given our clients. It was time to move a new boar in and we had to find a slaughterhouse to do the kill and process, with the new regs in PA and the slaughterhouse we are using he was too big for them to handle legally. So I asked around and found a place. We had a few other finished feeders to send with him and they came back as expected, basically. the weights were right, but the cuts weren’t as good as expected. But our boar was way off, first he messed up the order and turned everything but the ham bacon and bones into sausage, or so he says. Mistakes happen I can live with that and the customer said where else can you get pastured sausage made from loins and roasts, so that wasn’t a game changer. But I don’t think the butcher expected us to keep good records. The live to hang was right on at about 71%, but the hung to packaged was only 50% and that included 36lbs of soup bones. Now maybe him being a large boar throws off the ratio, he was a really long boar, and at 1 year 7 months just over 500lbs live weight. I sell hung weight to a local organic farmer. and we were going through everything together. and this really upset me. I am just looking for advice on how to handle this with the slaughterhouse. They were in the middle of their deer season and I was the only pig slauhgter they had for a 3 month period. I picked everything up yesterday, sorted through it all today and was planning to visit tomorrow. So advice from a cooler head would be appreciated. I have no plans on using him again now, especially considering the weights he gave for processing sausage and smoking hams were drastically inflated as to what was there. I don’t expect a 15% loss on sausage or and 36% loss in weight on a short smoke. Sorry for the rant, just don’t wanted to explain to someone who may have experience and rational advice. Too big to handle? I find that odd. I have watched them do 2,000 lb animals at Adams Slaughterhouse where we take ours and my wife has seen them do big bull buffalo which are even larger. That is pretty standard capacity. Our biggest pig was 1,700 lbs and that is very large for a pig. Someone may be feeding you a line of hog wash. Ask to see the regulations in writing if you care. As to the yield, since almost everything went to sausage and bacon did you deduct of the large weight of the bones? That could be well over 100 lbs easily on a big boar. Depending on how closely they trim the meat off the bone there could be a lot of loss there of meat – I’ve seen butchers who do a very poor job of deboning and waste a great deal of meat to the rending can. We get more than 36 lbs of bones on most finisher size pigs so that means there was a lot of missing bone. Next is fat? Was the boar fat? I’ve seen butchers trim off and throw away the fat. That could be a big loss of weight right there. Hot skinning wastes far more than scald & scrape and then cold skinning but for very big pigs they do have to hot skin. Adams has scald & scraped sows and boars as big as 600 lbs for us which is pushing the weight limit of the scalder. I have had a lot of trouble with three butchers in the past – one was stealing $114 worth of meat on average per pig week after week even though I confronted them with the problem. I do keep good records and know the cuts of a pig. This went on for years with that butcher only because they had a monopoly lock on us with the scald & scrape plus vacuum packaging we must have for retail sales in stores. Once Adams Slaughterhouse opened we started driving six hours to Mass to take our pigs there every week. It has been well worth the extra time and gas because the Adams family is honest and hard working. If you find a good honest butcher, cherish them. There is not much you can do now regarding that pig. The USDA doesn’t care about pilferage so don’t bother approaching them on that. They care about humane animal handling, sanitation and producing safe food – that is their mission. Even quality is something they do not consider other than grading of beef – that is clearly stated in their documentation. They do discuss pilferage as being a major industry problem but they offer no solution other than locks and supervision. The best thing you can do is to find an honest butcher and not use the problem butcher again. Careful not to say much – if another farmer asks, just say that you would not go back there after your experience. That is saying enough. Word gets out. 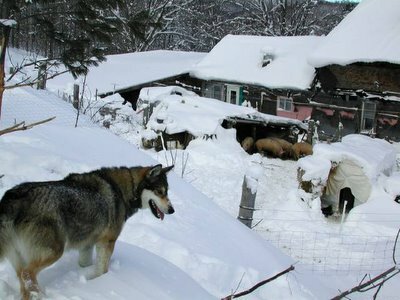 The butcher who stole from us for years ended up moving out of state – a lot of other farmers told me they had problems with him too. I’m about to finish up my first round of pastured pigs. I ran 14 ossabaw x gloucester old spots through at least 5 acres of pasture (mob-grazing style). They are currently being finished in 4 acres of open canopy woods. My goal was to limit their grain ration to 400 lbs per pig, but I may end up a little higher than that to get them to a finish weight of 200 lbs at 9 months of age this November. I would like to use a lot of your information on butchering to educate my customers on how to choose their cuts. I have cited your website and blog in the document I’m sending out as the primary source for information. 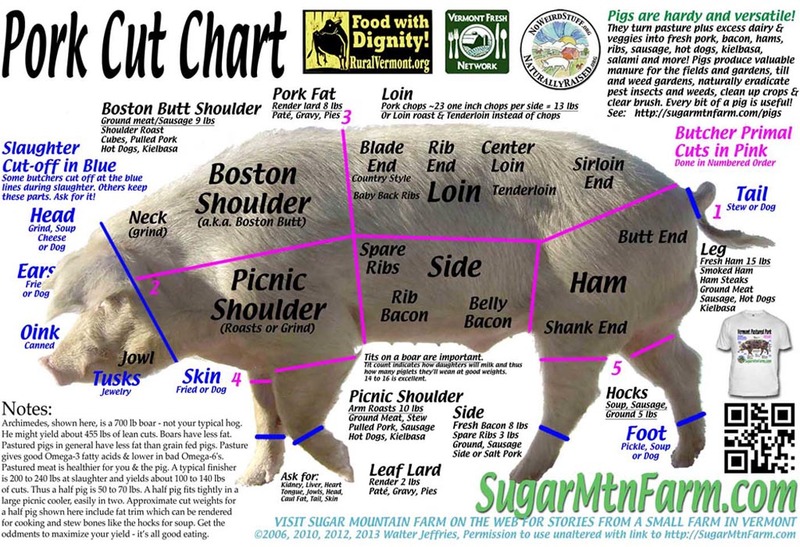 I’d also think it would help to use the “Pork Cut Chart” as a visual. Would it be alright to paste this diagram into the document I’m sending out to my customers? Also, a thought occured to me when I was responding to a friend’s question on how much a whole pig cost, including butcher fees. If someone orders a half a hog, does the butcher cut the head and tongue in half? Or do the two splitting the hog duke it out? Thanks again for all your help. 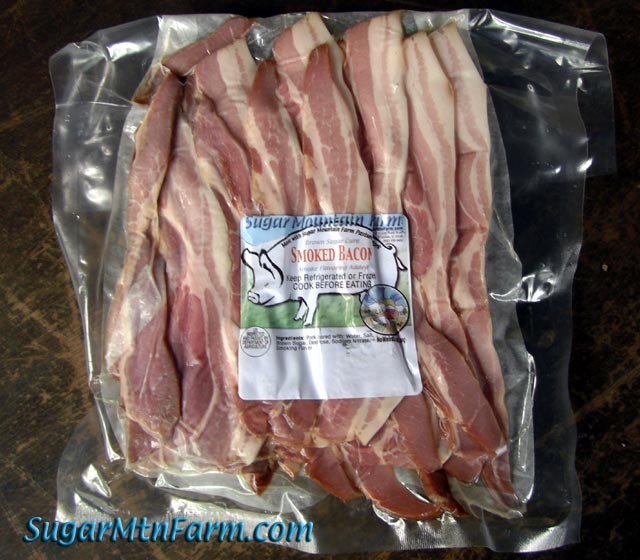 If I’m ever in VT, I’m looking out for Sugar Mountain Pork! Ossabaw are slow growing pigs from what I’ve read, no personal experience, and lower growth means longer time to grow which means greater feed consumption and lower feed efficiency. Out on pasture this is not a big issue but when feeding grain it can get expensive. Feel free to use information from the articles here and please do provide links back to the sources. 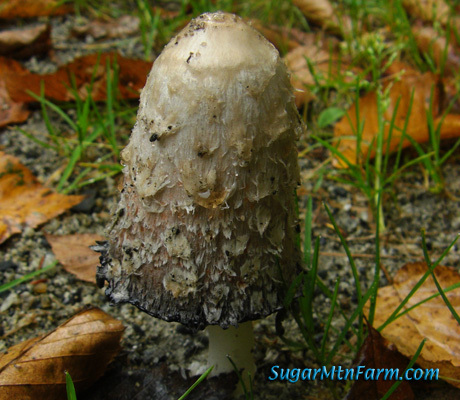 If you see a photo or cut chart you would like to use I will generally say sure as long as you don’t alter it and do provide a link back on the web or if in print provide the URL (e.g., SugarMtnFarm.com) clearly visible. I don’t mind sharing with farmers who aren’t competing directly in my own market (Vermont area) if they provide credit and links. Generally when splitting the pig the butcher does not split the tongue. The skull does get split. how much half pig 70kg ,I just prerezes the field and I carve it. You can purchase a half pig as a carcass half and then do your own cutting. The pig is $5/lb plus $40 for the slaughter. See the order form on the Literature Page for details and see the Pork Page. To order you can mail the order form with a $100 deposit. We’re currently scheduling for February deliveries. Thanks for the post. I’ve never seen a chart for the uses of a pig. Thanks. 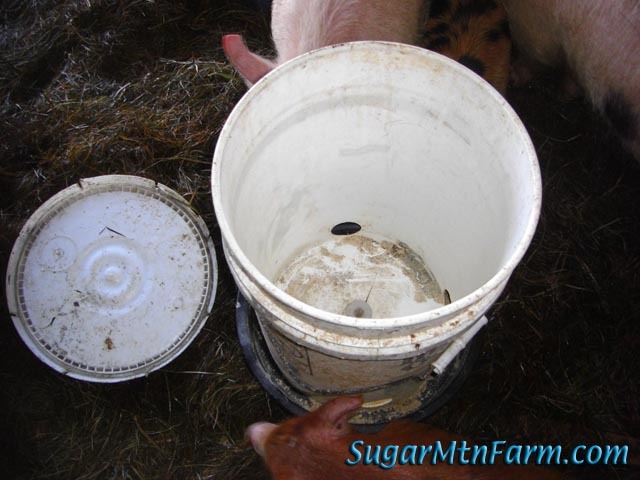 If a pigs live weight is 800 lb is there a way to estimate the hanging weight? The short answer is yes. 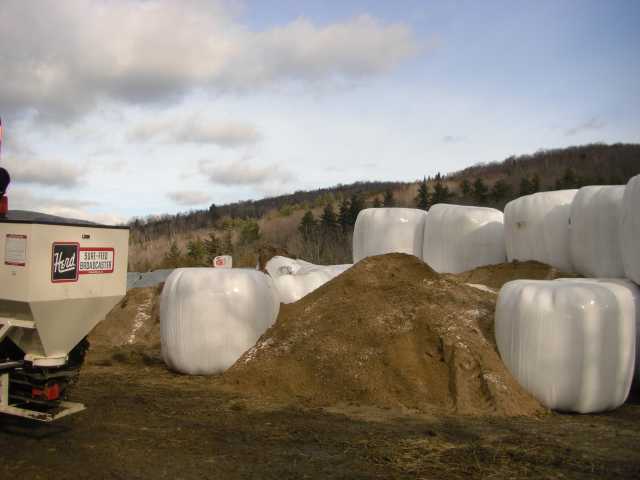 See this article for a detailed answer about Carcass Yield. We can do roasts bone-in or bone-out as you like. But does the 75lb weight reflect bone in or bone out portions? Depending on the pig and what you want it can be either way. If you want bone out I can cut the bones and bag them separately for you to make soup. By cutting the bones I expose the marrow which helps in soup making. See the whole pig order form on the Literature Page which will give you more numbers to think about. Remember not to use too sharp a pencil.